Spring is here and the changing season reminds us that maybe it’s time to take a look at our wardrobe and freshen it up a little as well. Admittedly, I get a little hung up on raw denim sometimes and don’t always branch out with other styles of pants. I’ve always been a fan of military inspired chinos though, so let’s rundown some of my favorites for a spring denim alternative. First let’s look at what makes something a chino. Chino cloth is a twill fabric that’s typically made of 100% cotton and is woven with diagonal parallel ridges on the surface. 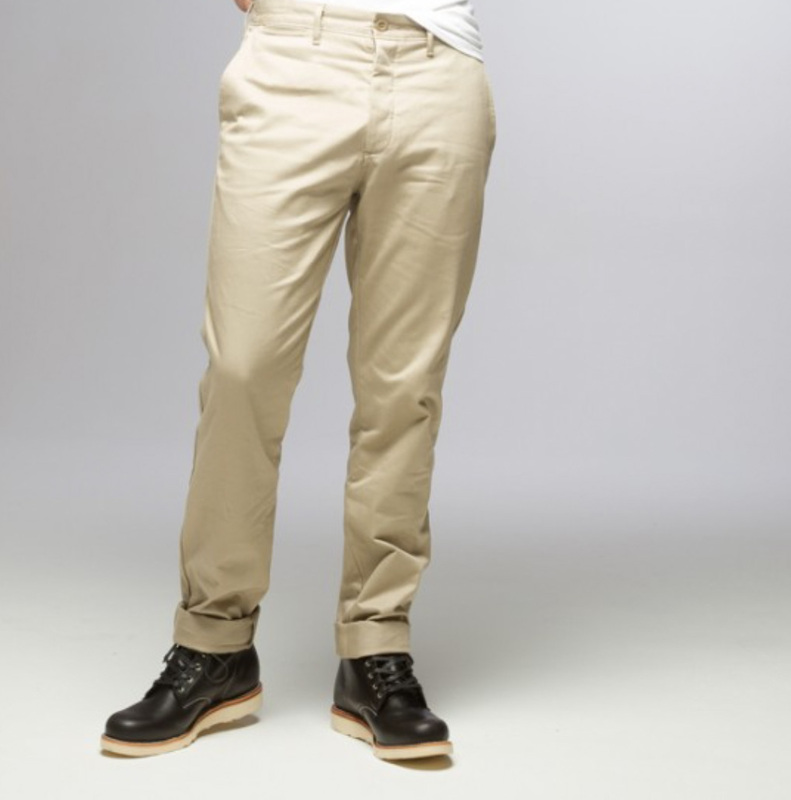 Chino trousers were originally designed in the mid-19th century for British and French military uniforms. It didn’t take long for the look to take hold and stick around for over 150 years. We still like them today for the same reason they were developed in the first place; they’re durable, tough, and neutral. There are plenty of great options if you're buying on a budget, stores like Target, Old Navy and Gap, as well as online brands like Combatant Gentleman offer modern, slim chinos at around $30-$50. If you find yourself in a position needing or wanting to invest in higher quality, consider these 9 brands that we're introducing in a new series called The Upgrade. I’m a fan of independent well-made brands, but when it comes to mainstream retail shops you can’t beat the quality of J. Crew. The 770 Broken-In Chino comes in six neutral colors and features an urban slim fit. These have been around since 2003 and made from heavily washed cotton for a vintage look. These will fit like an old friend. Bonobos started because they couldn’t find pants that fit correctly. Their secret is their signature curved waistband that conforms to the natural shape of your waist. The result is a trimmer more flattering cut with the perfect medium rise. What sets them apart is 365-day returns, free shipping both ways, and their “ninja” customer service. They have over 20 locations too. Just schedule a one-hour appointment at one of their guideshops and have a cold one while a guide helps you find the perfect fit. They come in 5 different fits and plenty of colors. I liked the Jet Blues shade, but they come in another 22, with names like pinebreakers, mojito, buckeyes, redrums, chino grigios, cappu chinos and graham slackers. Clever. Naked & Famous is a Canadian brand that is known primarily for its denim. These are 12 oz selvedge chino made from Japanese fabric. They have a slim fit that tapers from the knee down. I love these so much that I grabbed two pair in khaki and olive. I dig the red selvedge seams and heavy construction. The Unbranded Brand is unique in that they don’t do any advertising or labeling. They do, however, use premium materials and quality craftsmanship. I have a pair of their steadily built denim. 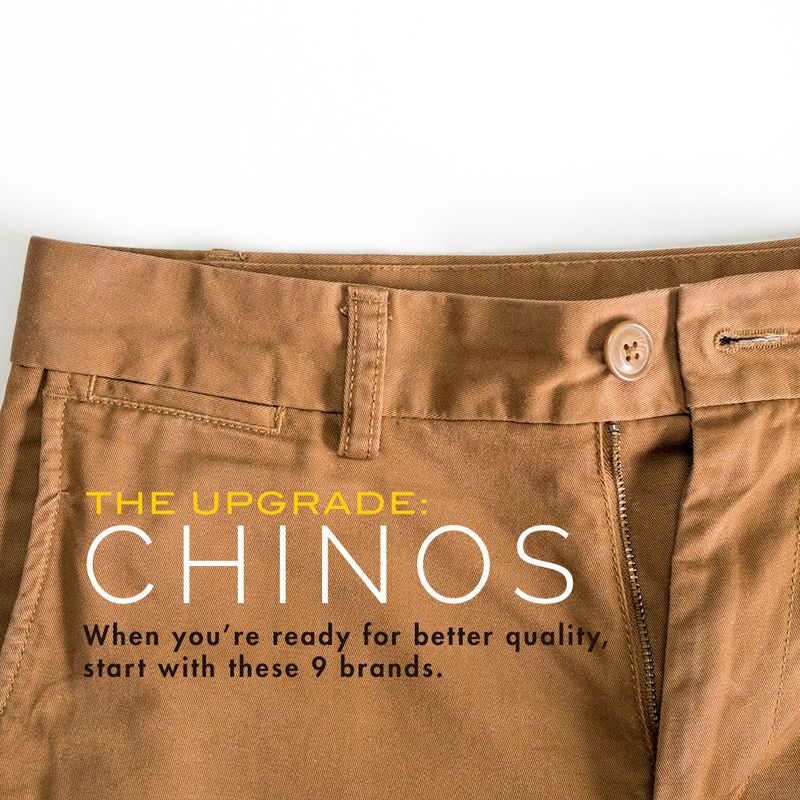 Their chinos come in skinny, tight, tapered, and straight. Available in beige, black, and navy selvedge with a smart leather patch, these chinos offer an affordable high-end experience without compromising quality. Tellason is one of my favorite brands, based in San Francisco. 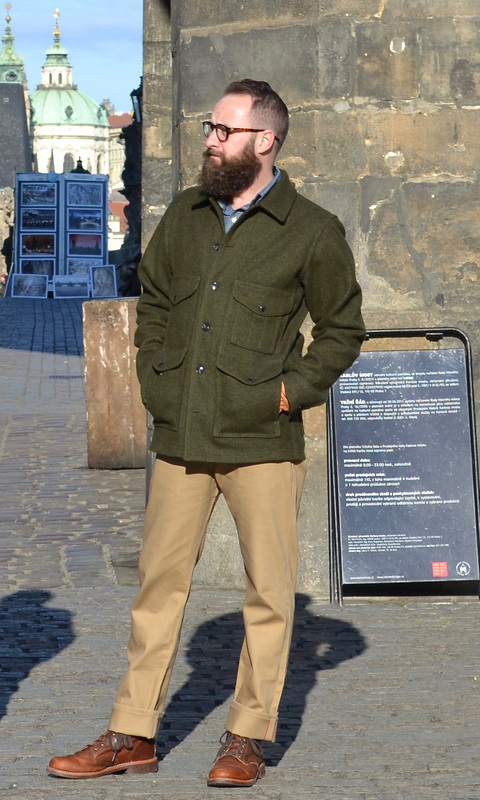 The Cramerton Chino is a tapered army cloth 8.8 oz chino with a corozo button fly. Cramerton twill was originally made in South Carolina in the 1930’s for U.S. Army uniforms. The fabric is still made the same way and in the same state, but cut and sewn in San Fran. Putting these on is like wearing a piece of history. If you’re looking for something that can be both dressy or casual there is always value in Banana Republic that won’t break the bank. 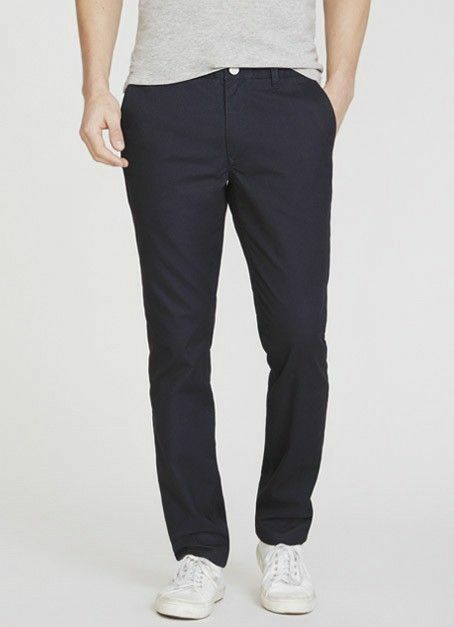 The Aiden Slim Bedford is a classic flat-front straight leg pant that are great for everyday wear. Available in four colors and perfect for relaxed weekends or social evenings. This one sits at the waist and is slim through the thigh with a slim leg opening. Sharp with a dress shoe and no socks. These are a little edgier and have a little bit of attitude. The Rogue Territory Officer Trouser is inspired by workwear. They are handmade in downtown Los Angeles and are made from 9 oz sanforized (pre-shrunk) twill. They have bright white selvedges and are slim fitting, if not a little on the tight side. The one piece button fly and slash front pockets are offset by the cool flaps on the rear pockets that can be worn tucked in or out. Available in several colors but I love the olive. When it comes to ruggedness and durability Freenote really makes the grade. With pants like this it’s all about the details. They have custom leather branding, custom corozo buttons and they’re made of 100% Japanese selvedge twill. The pocket bags are herringbone from Japan too. These are made for the long haul and will last a long time. These have the highest price point of the lot, but for good reason: They are made by one pair of hands from start to finish. Owner Amos Culbertson takes the phrase “small business” to the extreme. 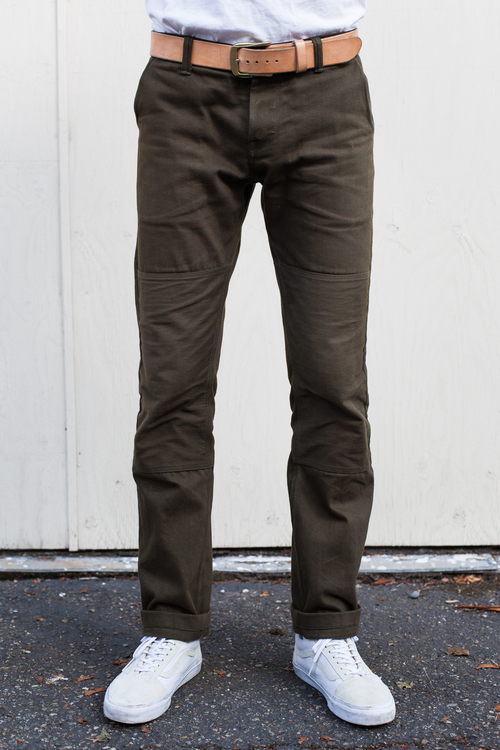 These work trousers are an 11 oz olive selvedge twill from Cone Mills in North Carolina. In fact, every piece of the pant comes from the United States. The coolest features are the reinforced knee panel that wears more like a patch and the utility pocket at the right thigh. 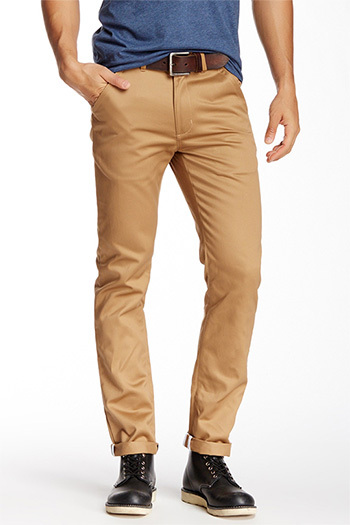 Have a favorite pair of chinos? Keep the list going in the comments. Just as a heads up to people in general and to the article writer in particular, Bonobo’s now has a 45 day period for full refund and 90 day period for exchange. They seem to have changed it about 4 weeks ago or at least that’s when I realized that the change had occurred. Great article! I’ve got chinos in: Olive, Ecru, charcoal grey, Stone and Tan. I’m starting to run out of couloirs but that was a great list. This is way more than I ever pay for chinos. Hit up Banana Republic for some comfy and decently-dressy pants for $60-70 bucks, or if you’re looking for something more casual, Dockers has some super comfy stuff you can often find on sale for 2/3 to 1/2 of that price. I love the way J Crew chinos look on my fella. Dockers on Amazon are also good for a lower price! Does it seem like half of these pics have chinos that are too tight? I can see the pocket outline on a chunk of them. As a guy who takes style photos for a living, picket lines are the bane of my existence. It has nothing to do with them being too tight, rather the pants are a thin material. All of the pockets on my well fitting pants are visible in photos. It’s just one of those things people don’t notice in person. The only one that might look too tight to me is the Naked and Famous Weird Guy, but it’s basically a jean, anyway. I have all types of these pants and bonobos are one of the worst quality for the price… Just my two cents. I noticed J. Crew got a shoutout but definitely don’t forget J. Crew Factory’s chino line. Tons of colors and fits, my favorite is the “Driggs” slim fit. Regarding quality, I bought my first pair two years ago and they are still going strong! How about some notes regarding which ones work for muscular thighs? I know there was a whole article for denims. A single sentence could give enough pointers to know which brands to look into. Dockers used to make an athletic fit, which I think was meant for larger thighs, but I’m not sure if they still do and that’s the only one I know about. Chinos are typically looser, so they probably think larger thighs shouldn’t be as much of a problem as it is with jeans. Interesting, seems quite the opposite to me. Slim fit seems to be the standard and, as has been stated before, Chinos are so thin that the pocket outline shows easily when it gets tight. Thanks for the recommendation though. 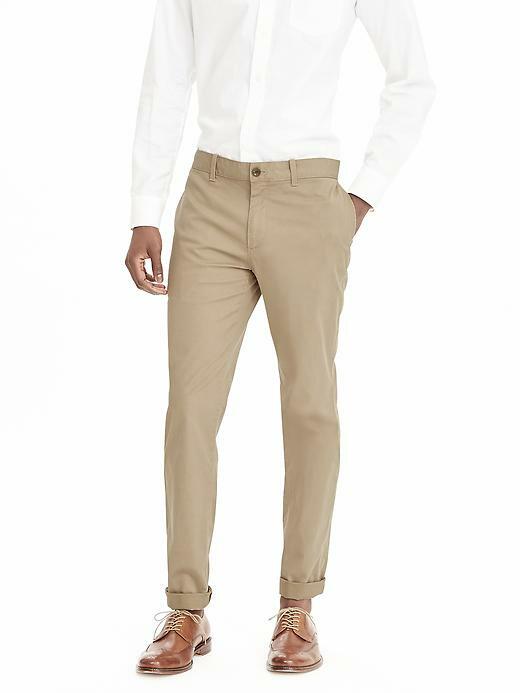 Dockers Alpha lines makes some chinos that are a heavier weight and might not show the pocket outline. They also have plenty of looser chinos in other lines. I know Eddie Bauer doesn’t typically get a lot of love around menswear circles, but they have a “Classic Fit” Legend Wash Chino, which is definitely casual, but fits quite well for me, my huge thighs, legs and etc. If you have not tried them, add these to the list…. Bill’s Khakis, made in Pennsylvania . The owner took the old WWII Khaki, and left it alone. They are made to last, and fit like a glove . The Banana Republic Fulton Skinny fit is also superb for guys who have meat on their legs but still find the Aiden fit to not be properly fitted around the ankle. I have no meat on my legs, but I love the Fulton fit and the ankle does have a lot to do with it. I like the Fulton a lot. My only real complaints are that they can be a little tight around my calves which cause them to ride up when i stand and they don’t launder very well. Orvis ultimate or Jack donnelly for those who want classic, slim or straight (not skinny) Khakis at affordable, not cheap prices. If you want Selvedge, gustin also does it at a good price. 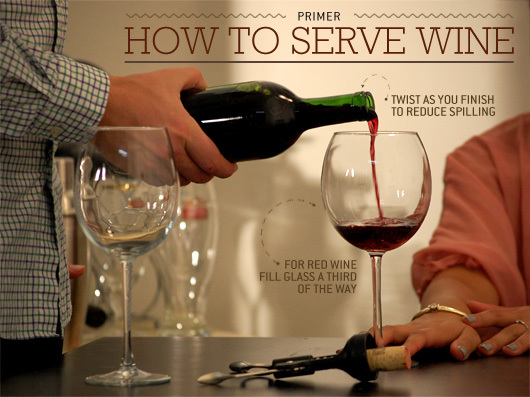 I like this “Upgrade” idea, even though most items are too expensive for my budget. Still, it gives me ideas if I want to spend more. The J.Crew Broken-In 770 doesn’t fit me well and it doesn’t taper enough. In contrast, I love Bonobos’ skinniest fit, because I’m quite slim. I also like Banana Republic’s Fulton and don’t know why the Aiden receives more attention. Dockers Alpha Slim-Tapered chinos seem to be falling out of favor for some reason, but I still love them and they’re probably my favorite chino. Isn’t Unbranded made by someone else? I’ve yet to try them. The N&F Weird Guy Selvedge Chino’s look great, but 5-pocket pants aren’t chinos, imo. Not to mention that the fabric on these looks just like denim. I like what I see a lot, because I love colored denim, but they just don’t look like chinos to me. 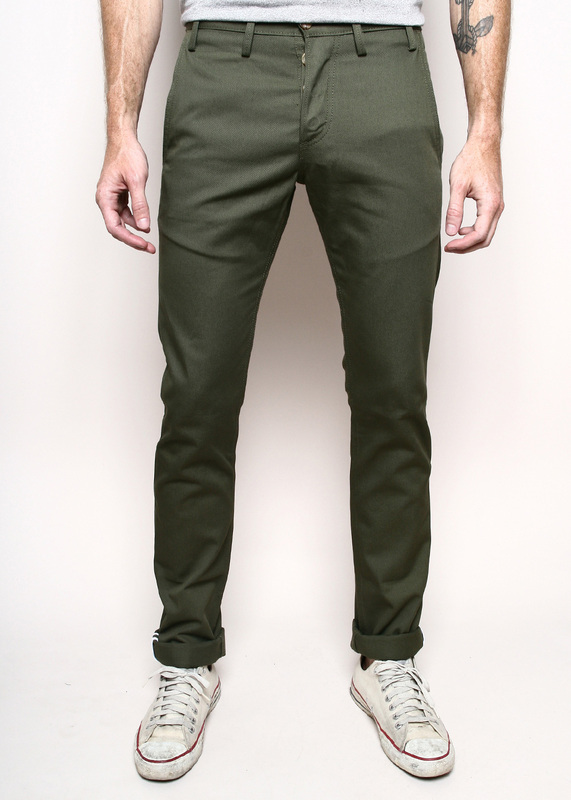 I really, really like Gustin’s duck chinos. They’re 12 oz. duck canvas, so they’re not the best for the hottest weather, but great for most of the year. The duck canvas fabric is different from twill, and I love the texture and look. If you go the Banana Republic route, I’d recommend signing up for email first and watching your inbox for coupon codes, which run almost constantly. The same is true for Gap and Old Navy. Does it qualify as ironic that Unbranded is branded with a blank patch of leather? 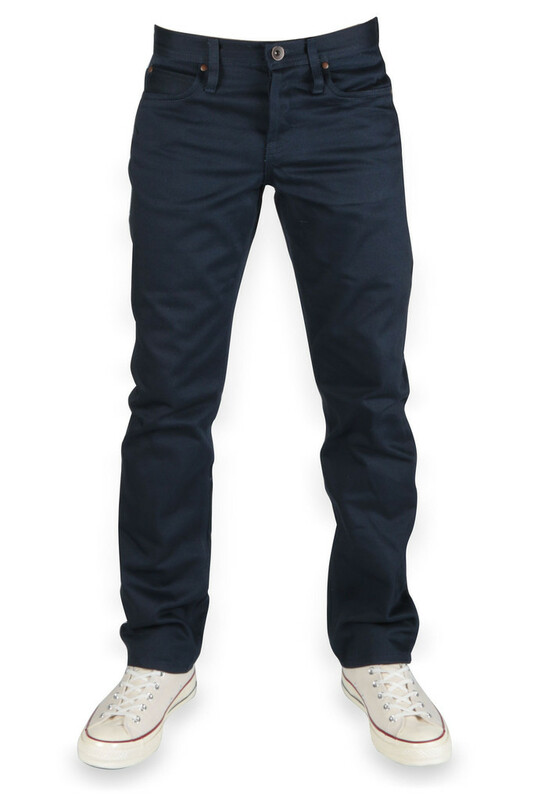 You should really check out the Abercrombie & Fitch chino collection, great fabric with stretch in certain – the indigo athletic taper is seriously amazing for a great price! Decent colors too! Jeremy! Have you checked out Mountain Khakis? The Slim Fit (formerly Broadway Fit) is pretty rad. They are a little bit more rugged and less streamlined but they are durable as heck and have a cool vibe to them. Jeremy, how do you feel about Mountain Khaki? 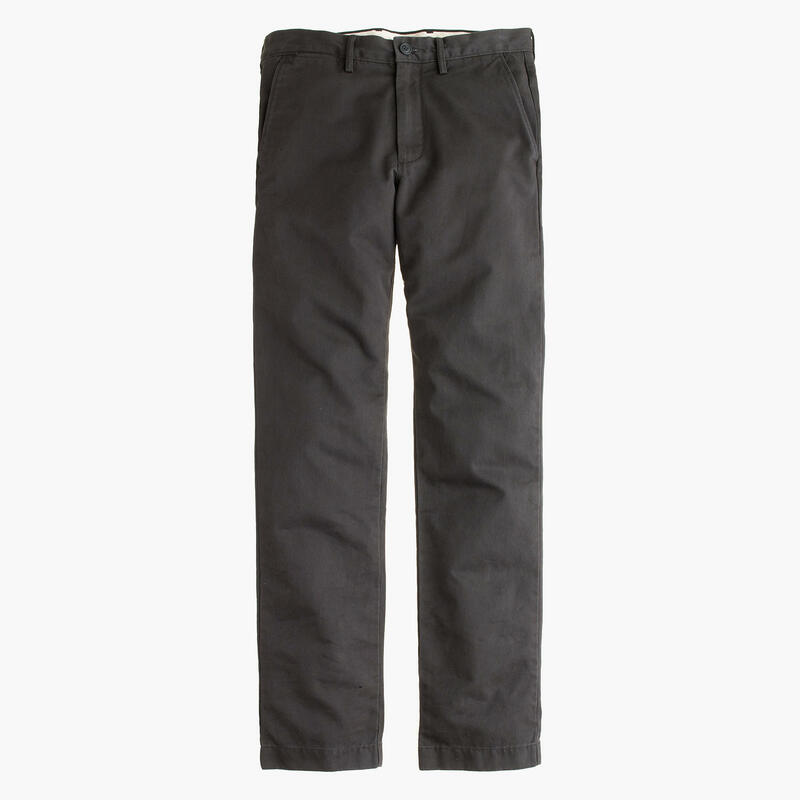 I was surprised to not see the Original Mountain pant in slim fit on this list.